Maryland-based RightEye now has clearance for its software that helps clinicians assess reading skills, brain health and functional vision. Bethesda, Maryland-based startup RightEye has just scored FDA 510(k) clearance for its cloud-based eye-tracking system and software. The technology was designed to help clinicians identify visual tracking impairments in patients by recording, viewing and analyzing a patient’s eye. The system has four main target areas: functional vision screening, reading assessments, sports vision assessment and training and brain health. Its functional vision screening mainly addresses occupational skills like the ability to drive a car or stay balanced when walking up stairs. 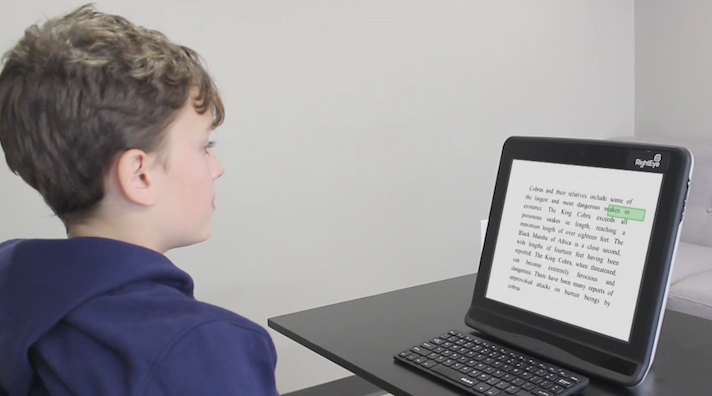 The reading assessment zeros in on how children see and can report a number of measurements including eye movement skills, binocularity, ocular motility, depth perception, reading regressions and reading comprehension. The brain health component was designed to give patients more information about their brain activity and identify any potential neurological problems. The tests can look at vertical saccades, choice reaction time and discrimination reaction time, as well as circular, horizontal and vertical pursuits. The sports Vision EyeQ section works to assess and analyze athletes visual markers, with the aim of improving amateurs and pro athletes performance. The company said the technology was designed to target a number of conditions that often go unnoticed. For example, it said that 50 percent of vision disorders in children go undiagnosed often because they have similar qualities to learning disabilities. These similarities include letter reversals, poor handwriting, low comprehension and short attention span. In some areas, such as the brain function test, the company claims “there has never been a high-precision measurement tool for eye tracking,” and goes on to say this is the first. The alternative in this area was the classic finger tracking test. RightEye has been in the digital health space for more than half a decade. According to Crunchbase, the company has raised $10.4 million in funding. In 2016 the company furthered its foothold in the space when it announced that it had acquired exclusive rights to two eye movement tests: one that aids doctors in quickly identifying early stages of autism in children 12 to 40 months old, and another for detection of Parkinson’s disease in all ages. Then, last year in June of 2017 it launched a game called Maze Master, which was designed to improve oculomotor control in children with reading disabilities.